The Rangers dug themselves a 2-0 hole in the 1st period, giving up two goals in a 27-second span, but rallied to beat the St. Louis Blues, 4-2, Friday night at The Garden. Alexandar Georgiev stopped 44 of 46 shots to get the win. St. Louis came into the game hoping to win and clinch a playoff spot. And after Vladimir Tarasenko and David Perron scored to make it 2-0 Blues, it looked like it might be a long night for the Blueshirts. A goal by Mika Zibanejad late in the 1st period was overturned, after a video review, on a goaltender interference call. But the Rangers started to score goals that counted in the 2nd. Ryan Strome‘s goal 2:22 into the period made it 2-1, and Pavel Buchnevich continued his hot play of late, tying the game, 2-2, at the 3:42 mark, converting a nice pass from Zibanejad. It was Buchnevich’s 19th goal of the season. In the 3rd, Jimmy Vesey scored at 5:47 to give the Blueshirts a 3-2 lead, putting the rebound of a Brett Howden shot past St. Louis goalie Jordan Binnington. The game remained 3-2 until Chris Kreider scored an empty-netter with 7.2 seconds to play, for the final 4-2 margin. Buchnevich had a goal and an assist to lead the Rangers. The Rangers [now 30-34-13, 73 pts] have five games remaining in the 2019-20 season. They play the Flyers in Philadelphia Sunday. The Rangers traded right wing Mats Zuccarello to Dallas Saturday, receiving two draft picks in return; a 2nd round pick in 2019 and a 3rd round pick in 2020. Each of those picks could improve, due to the conditions in the deal: the 2019 2nd rounder could become a 1st round pick if the Stars win two rounds in the upcoming playoffs, and the 2020 3rd rounder could become a 1st round pick if Zuccarello signs new contract with Dallas in the off-season. Zuccarello’s contract is expiring at the end of the current season and he is to become an unrestricted free agent. He can sign with any team July 1st. Pavel Buchnevich and Vladislav Namestnikov scored goals eight seconds apart in the 3rd period, to break open a one-goal game, and the Rangers cruised to a 6-2 win over the Sabres Friday night in Buffalo. Alexandar Georgiev got the start in goal for the Blueshirts, and made 31 saves for his 9th win of the season. The Rangers jumped out to a 2-0 lead after one period, on goals from Boo Nieves and Jesper Fast. Fast goal at the 14:03 mark, deflecting a Namestnikov shot past Buffalo goalie Linus Ullmark, was his 8th goal of the season. Jeff Skinner made it a 2-1 game just 53 seconds into the 2nd period, scoring his team-leading 35th goal of the season. Jimmy Vesey made it 3-1 New York at 1:51 of the period, off a brilliant pass from Buchnevich behind the net. Skinner would score again, at 16:56, to make it 3-2 after two periods. It stayed a 3-2 game until there was 4:01 to play, when Kevin Hayes faked a shot, and passed it to Buchnevich, who scored to make it 4-2. Then, after a misplay by Ullmark, Namestnikov stole the puck and scored with 3:53 remaining to make it 5-2. Namestnikov would add an empty-net goal for the final 6-2 margin. He finished with two goals and one assist; he had gone 23 games without a goal. The Rangers [now 25-24-8, 58 pts] play the Penguins Sunday afternoon in Pittsburgh. Alexandar Georgiev stopped 55 of 56 shots, on his 23rd birthday, as the Rangers beat the Toronto Maple Leafs, 4-1, Sunday night at The Garden. The Blueshirts have won two of their last three games, and 6 of the last 10. Mika Zibanejad got the Rangers on the board just 28 seconds into the game, putting a rebound past Maple Leafs backup goalie Garret Sparks for a 1-0 New York lead. Kasperi Kapanen tied the game at the 10:35 mark of the 1st, scoring his 16th goal of the season. But Jimmy Vesey gave the Rangers a 2-1 lead at 14:05, taking a pass from Chris Kreider and beating Sparks up high for his 12th of the season. Neither team scored in the 2nd period. In the 3rd, Adam McQuaid scored his 2nd goal of the season, and 2nd goal in seven days, to make it 3-1 with 8:01 to play. Kevin Hayes added an empty-net goal with 20 seconds to play for the final 4-1 margin. The Rangers [now 24-23-8, 56 pts] play the Jets Tuesday night in Winnipeg. 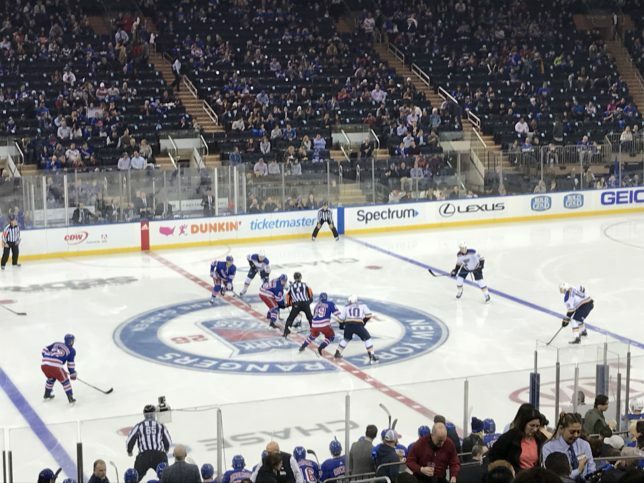 Adrian Kempe scored the game-tying goal with 59 seconds remaining in regulation, and Tyler Toffoli scored just 25 seconds into overtime, as the Los Angeles Kings came-from-behind to beat the Rangers, 4-3, Monday night at The Garden. The Rangers have now lost three of their last four games. Toffoli’s game-winner came moments after Mika Zibanejad hit the post at the other end. The Blueshirts led 1-0, 2-1, and then led 3-2 with 10:45 to play, on Adam McQuaid‘s 1st goal as a Ranger. McQuaid’s wrist shot from just inside the blue line beat Jonathan Quick, a most unexpected goal from an unlikely source. Chris Kreider [8:32 into the 1st period] and Zibanejad [just 32 seconds into the 2nd period] scored the other New York goals. Zibanejad finished with a goal and an assist and now has 52 points in 52 games this season. Henrik Lundqvist made 26 saves. The Rangers [now 22-22-8, 52 pts] host the Bruins Wednesday night at The Garden. Linemates Chris Kreider, Mika Zibanejad, and Mats Zuccarello each scored a goal, powering the Rangers to a 4-3 win over the Chicago Blackhawks Thursday night at The Garden. Henrik Lundqvist made 24 saves, notching his 445th career win, tying him for 6th place all-time, with Terry Sawchuk. After Brandon Saad scored a power play goal 5:41 into the game to make it 1-0, Filip Chytil scored an electric, unassisted goal at 13:20 to tie the score, 1-1. Zuccarello pushed in a loose puck at 17:38 to make it 2-1 Rangers. In the 2nd period, Kreider’s team-leading 22nd goal of the season, at 13:09 made it a 3-1 New York lead. The Rangers [now 20-20-7, 47 pts] play the Bruins in Boston Saturday night. Mika Zibanejad had two goals and two assists, one of a trio of Rangers to score twice, as the Blueshirts beat the Carolina Hurricanes, 6-2, Tuesday night at The Garden. Pavel Buchnevich scored a pair of power-play goals, and Anthony DeAngelo scored his 3rd and 4th of the season. The Rangers have now beaten the Hurricanes at The Garden 16 straight times. Coming on the heels of Sunday afternoon’s clunky 7-5 loss to Columbus, the Blueshirts played one of their strongest games of the season, playing solid hockey in both ends of the ice. Saku Maenalanen had both Carolina goals. Mats Zuccarello had three assists. Chris Kreider and Boo Nieves each had two assists. Henrik Lundqvist stopped 34 of 36 shots to get the win. The Rangers [now 19-20-7, 45 pts] host the Blackhawks Thursday night at The Garden. Five goals should be enough to win most hockey games. In fact, it would’ve been enough to win about 35 games so far this season. Sunday night in Columbus was not most hockey games. The Blue Jackets scored early and often, beating the Rangers, 7-5, Sunday night, despite two goals from Mats Zuccarello. Columbus outshot the Blueshirts, 40-27. After digging a 6-3 hole in the first minutes of the 3rd period, the Rangers got goals from Zuccarello and Jimmy Vesey to narrow the gap to 6-5 with 3:12 to play. But Nick Foligno’s goal at the 18:14 gave Columbus their winning margin. It was Foligno’s 2nd goal of the game. Ryan Strome (his 7th) and Chris Kreider (his 21st) scored the other New York goals. Artemi Panarin, Anthony Duclair, Cam Atkinson, Lucas Sedlak, and David Savard had the other Blue Jacket goals. The Rangers [now 18-20-7, 43 pts] host the Carolina Panthers Tuesday night at The Garden.